The United States’ first two legislative measures seeking to add health-warning labels to sugar-sweetened beverages aren’t winning battles against Big Soda yet, sponsoring lawmakers conceded, but they are bolstering the war effort. 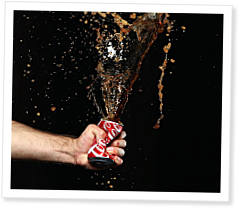 “It’s part of a national movement,” said Sen. Bill Monning, the Democrat who first introduced the Sugar-Sweetened Beverages Safety Warning Act in February 2013 as Senate Bill 1000 in the California State Senate. During the next legislative session, which is scheduled to begin in December 2015, the senator from Carmel said he intends to revisit efforts aimed at reducing consumption of sugar-sweetened beverages. Meanwhile, in New York state, Assemblyman Jeffrey Dinowitz, a Democrat from the Bronx, modeled his Sugar-Sweetened Beverages Safety Warning Act after Monning’s measure. Dinowitz introduced the bill in January. Two of the New York Assembly’s committees—Health as well as Consumer Affairs and Protection—held a joint public hearing on the bill in April. Dinowitz intends to vigorously pursue the measure come January. In early November, CrossFit Inc. Founder and CEO Greg Glassman is scheduled to visit a handful of affiliates throughout California to rally support for a health-warning-label bill in the state where CrossFit is headquartered.